If Tally.ERP 9 has turned to educational mode on Tally License Server machine, you can check the probable reasons and the corresponding solutions. This is applicable for Silver & Gold Edition. The reasons for Tally license turning to educational mode on license server machine, and the steps to resolve this issue are given below. 1 License file path is incorrect 1. Check if the Tally.lic file is available in the Tally folder. (Right click Tally icon > click Properties > click Open File Location ). o	Press Alt+D to view the path, and press Ctrl+C to copy it. o	Go to Gateway of Tally , press F12 > Licensing > Configure Existing License . o	Press Backspace to select License File and paste the copied path in License file path (by pressing Ctrl+Alt+V ). •	Go to Gateway of Tally , press F12 > Licensing > Configure Existing License > Press F2 to search the available Active Gateway Servers . •	Select an active Tally Gateway Server to access the License. •	Check if the Gateway Services have stopped. •	Press Windows+R on the keyboard. In the Run command window, type s ervices.msc and press Enter . The service management window opens. Check the status for Tally Gateway Server. If it has stopped, right click and Start the service. •	Press Windows+R on the keyboard. In the Run command window, type s ervices.msc and press Enter . The service management window opens. Check if there are multiple Gateway Services. •	If multiple gateway servers are found with status as Running , select the Gateway Server which is not required, right click and Stop the service. •	Ensure that the Gateway service with highest Port number is Running . •	Check if you have tried to install Tally multiple times in same machine. •	Search for Tally.lic file in the system. •	If there are multiple Tally.lic files, check the file location. Take a backup of the data in those folders, uninstall the additional installations of Tally, and delete the Tally.lic files. Do not delete the Tally.lic file from the Tally folder which you are currently accessing Tally. •	Configure the License file path if available inside the current folder or Reactivate the License . If above scenarios does not exist, then Reactivate the License on the machine. If you have formatted the machine, hard disk has crashed, or windows are upgraded, Reactivate the License. Do not follow the procedures mentioned in the above table. 2. Services availed in another state by paying central and state tax, are appearing under "Mismatch in Nature of transaction and Place of supply, Party's country" in GSTR-1 and GSTR-3B. How to resolve this exception? You can click A : Accept as is , to accept the voucher as a valid transaction, and include it in the relevant tables of GSTR-1 and GSTR-3B returns. 3. Why is the receiver name blank and not exported to GSTR-1? 4. Can I export e-Way Bill details of a transaction in MS Excel or JSON format, without details of Part B of e-Way Bill (transporter ID and mode of transport)? Tally.ERP 9 supports generation of MS Excel and JSON files with e-Way Bill details, as per the requirements of offline utility tool provided by NIC. As NIC's offline utility tool does not support export of data without transport details, the same cannot be done from Tally.ERP 9 as well. However, you can generate e-Way Bill without transport details, by entering the transaction details directly on the portal. 5. Why is the party type Government Entity, not appearing in the party ledger? What will happen to the transactions recorded with this party type in releases upto 6.4.6? As the department has not asked for any bifurcation of transactions with party type as government Entity. All the parties which have been created earlier under, government entity will be mapped to the party type Not Applicable . 6. As the department has not asked for any bifurcation of transactions with party type as government Entity. All the parties which have been created earlier under, government entity will be mapped to the party type Not Applicable . ● Check if any of the transactions are appearing under Incomplete/Mismatch in information (to be resolved) , and resolve them. ● Check if any of the transactions are appearing under Not relevant for returns . Check those transactions and include them if relevant. ● Check for sales entries recorded in Receipt or Journal vouchers. These transactions are included in the GST returns, but will not form part of the Sales Register . 7. How to record interstate sales made to embassy/UN body, and in which fields of the returns will it be captured? New natures of transactions are introduced for interstate sales made to Embassy/UN body. Exempt sales will get captured in table 9 ( Nil Rated Invoices ) in the return format view of GSTR-1 . 9. Is it required to show GST calculation in Delivery challan? If so, what is the impact on GSTR-1? It is required to show GST calculation in the delivery challan. A delivery challan can only be used for the transfer of stock between branches operating with the same GSTIN number within a state. 10. Can I get tax-rate-wise break-up on GSTR-1 and other GST return forms? You can view the tax-rate-wise break-up in the Summary view of GSTR-1 and GSTR-3B . 11. When will credit note entries participate in Credit/Debit Notes (Unregistered) - 9B in GSTR-1? When debit notes and credit notes are recorded against B2C(Large) Invoices - 5A, 5B for unregistered dealers or consumers, they will appear in Credit/Debit Notes (Unregistered) - 9B in GSTR-1 . Debit notes and credit notes recorded against B2C(Small) Invoices - 7 will not appear here. They will appear with negative values in the same table. 12. Why does the Total Value in HSN/SAC Summary not match the Invoice Amount in the GSTR-1 return format? The total of the assessable value and the tax amount appears as the Total Value in HSN/SAC Summary . It does not include the values of additional ledgers not enabled for GST. The Invoice Amount in the GSTR-1 return format view considers the assessable value and the tax amount, along with additional ledgers not enabled for GST. Hence, the Total Value in HSN/SAC Summary will not match the Invoice Amount in the GSTR-1 return format. 1. Services availed in another state by paying central and state tax, are appearing under "Mismatch in Nature of transaction and Place of supply, Party's country" in GSTR-1 and GSTR-3B. How to resolve this exception? 2. Why is the receiver name blank and not exported to GSTR-1? The user-defined name entered for the ledger in Tally.ERP 9, may or may not be the same as the trading name registered with GSTN. Also, the registered Trading Name gets auto populated under Receiver Name in the GST portal. Hence, the Receiver Name will be blank in the GSTR-1 file exported from Tally.ERP 9. 3. Can I export e-Way Bill details of a transaction in MS Excel or JSON format, without details of Part B of e-Way Bill (transporter ID and mode of transport)? 4. Why is the party type Government Entity, not appearing in the party ledger? What will happen to the transactions recorded with this party type in releases upto 6.4.6? The transactions of the party type Government Entity , was captured in Table 3.2 Supplies made to UIN holders of GSTR-3B, which is not required by the GSTN. Such interstate transactions of taxable goods with government entity, are captured in Table 3.1 a - Outward taxable supplies (other than zero rated, nil rated and exempted) as specified by the department. As the department has not asked for any bifurcation of transactions with party type as government Entity. All the parties which have been created earlier under, government entity will be mapped to the party type Not Applicable. 5. How do I identify the difference between Sales Register and GSTR-1 return? You can do the following to identify the differences. 6. How to record interstate sales made to embassy/UN body, and in which fields of the returns will it be captured? 7. Where do exempt sales get captured on GSTR-1? 8. Is it required to show GST calculation in Delivery challan? If so, what is the impact on GSTR-1? The GST details recorded in the delivery challan will not have an impact on GSTR-1 . 9. Can I get tax-rate-wise break-up on GSTR-1 and other GST return forms? 10. How do I find out GST Liability and GST Input Credit? o To view GST liability, go to Gateway of Tally > Display > Statutory Reports > GST > GSTR-1 . And, to view the ITC, go to Gateway of Tally > Display > Statutory Reports > GST > GSTR-2 . o Go to Gateway of Tally > Display > Account Books > Ledger . Select the GST ledger. In the Ledger Vouchers report, the debit balance displays the ITC. And the credit balance displays the tax liability. o Go to Gateway of Tally > Display > Account Books > Group Summary > Duties & Taxes . The debit and credit balances of GST ledgers appear in the Group Summary . 1. How to remove cash/trade discount in an invoice? In the item invoice mode of sale invoice, press F12 > F12 > set the option Activate cash/trade discount? to No . 2. Is it required to print the date and time of removal of goods for GST invoices? No. It is not mandatory to print the date and time of the removal of goods in the GST invoices. 3. The Sales Invoice format changed after upgrading and activating GST. Why? Tally.ERP 9 Release 6.0 onwards, the invoice formats have been enhanced for GST. The invoice formats currently supported are Tax invoice , Bill of Supply , and Advanced Receipts . 4. What happens if I delete invoices? If the method of voucher numbering is set to Automatic , then duplication of the invoice number might occur if you delete invoices. For GST transactions, unique voucher numbers have to be used for all your vouchers. Therefore, we recommend that Automatic (Manual Override) should be set as the method of voucher numbering, which will ensure that unique voucher numbers are set for your vouchers. 5. Can I have both exempt and non-exempt goods in the GST bill? Yes. Exempted/Nil-rated and Taxable goods can be part of the same bill; once recorded, the total invoice value will appear in B2B Invoices - 4A, 4B, 4C, 6B, 6C table of GSTR-1 report. It will also form part of the HSN wise Summary . However, if you bill exempted/nil rated goods separately, they will appear in the Nil Rated Invoices - 8A, 8B, 8C, 8D table. If you want to capture the values of only the taxable items as a B2B invoice, as per GST rules record separate invoices for taxable items. Use separate invoices (bill of supply) for sales of exempt/nil rated items. 6. How do I pass multiple tax rates for multiple stock items in a single invoice? In a single invoice, select the stock items attracting different GST rates, and then select the tax ledgers. Press Alt+A to view the tax calculations for each of the stock items selected in the invoice. Refer to Recording Local GST Sales for more information. 7. Why are CGST and SGST not getting calculated in my invoice? ● Ensure that the date of your transaction is on or after 1 July 2017. ● Select the tax ledgers individually while recording a transaction. Alternatively, create a voucher class to automate the calculation of the GST rates. Refer to Using Voucher Class for Auto Calculating GST in Vouchers for more information. ● Ensure that you have selected the state of the party in the party master, or in the Party Details screen while recording a transaction. Refer to Calculating GST in Invoices . 8. Why is IGST not getting calculated in my invoice? ● Select the tax ledger while recording a transaction. Alternatively, create a voucher class to automate the calculation of the GST rates. Refer to Using Voucher Class for Auto Calculating GST in Vouchers for more information. ● Ensure that Integrated Tax is selected as the Tax type in the tax ledger selected in the invoice. ● Ensure that the state of the party in the party master, or in the Party Details screen of the invoice is different from the state selected in the company master.. Refer to Calculating GST in Invoices . 9. Why is my VAT TIN getting printed on the bill? VAT TIN gets printed on the bill when VAT is enabled along with GST. If you do not want TIN to be printed, then you can deactivate VAT features . 10. Why is incorrect GST amount displayed? 11. How can I remove GST rates from the Stock Item master? 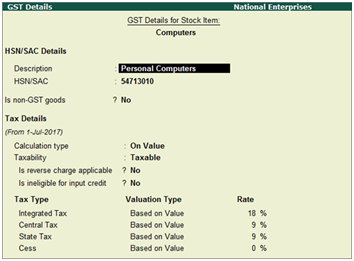 You can remove the GST rates from the Tax Rate History of the GST Details screen in the stock item master. 1. In the Stock Item Alteration screen, enable Set/alter GST Details? 2. In the GST Details screen, click L : Tax Rate History and remove the date using Space Bar , and save. 1. I have a multiple-location customer with different GSTINs. Do I need to maintain multiple ledgers or can I create multiple addresses with respect to their GST in one ledger? You can create multiple addresses for one customer in Tally.ERP 9, and update all the GSTINs of that customer along with the corresponding address. 2. If our company has multiple GSTINs, do we need to have one company with multiple godowns, or should we create multiple companies in Tally.ERP 9? You can have only one GSTIN per company. If you have multiple GSTINs, you need to create multiple companies in Tally.ERP 9. 3. How can I adopt GST in case I am not maintaining Inventory? You can enable the option Maintain Accounts Only in F11: Features > F1 , and enable GST in F11: Features > F3 . 4. Can I use a common GST tax ledger for all GST tax types? If not, why? o It will help in the payment of tax under separate tax type heads as required by GSTN. o It will help in availing input tax credit for each tax type. o It will help the government in ascertaining the revenue for each tax type, which will enable smooth revenue-sharing mechanism. 5. How do I claim Input Tax Credit (ITC) for the purchase of capital goods? There is no separate process for claiming ITC for the purchase of capital goods. The tax paid on the purchase of capital goods is added to the e-credit ledger, which can be used for input credit at any time. 6. What do you mean by ineligible for input credit? The tax paid on procuring certain services and goods is not eligible for input credit. Services such as renting of motorcab, supply of tour operator services and items that are used in manufacturing of exempt goods fall under this ineligible for input credit category. You can not claim credit for tax paid for these items. In Tally.ERP 9 you can set goods or services as ineligible for input credit by enabling the option Is ineligible for input credit? to Yes in the GST Details screen of the item master or purchase ledger. This option can be activated by enabling Set ineligible input credit? to Yes under F12: Configure . 7. How does auto calculation happen for central tax/state tax/integrated tax using voucher class? Auto calculation will happen when you create a voucher class with central tax/state tax/integrated tax as a default additional ledger. 8. How to calculate GST on free supplies? GST is not applicable on free supplies or samples. In Tally.ERP 9, enable the option Use separate actual and billed quantity columns under F11 > Inventory Features. Now, enter separate billed quantity and actual quantity including the quantity of free supplies/samples while recording the transactions. The value of invoice will be based on billed quantity and quantity of free supplies/samples will be added at zero value. In case a separate invoice is created for free supplies/samples, record the invoice with zero value. 1. How to report self-invoices to the department in case of transactions with unregistered dealers? You can record a journal voucher for increase in the tax liability, and tax credit when you purchase from unregistered dealers . For this, you need to debit and credit the same tax ledgers by entering the tax values. Report this transaction to the department as a self-invoice. This transaction appears in B2BUR Invoices - 4B of the GSTR-2 report. 1. Why is the HSN code provided for excise not getting copied in Tax Rate Setup screen of the GST menu for the said item? The HSN code under GST needs to be furnished based on the turnover limit of the dealer during the previous financial year. Therefore, Tally.ERP 9 does not forcefully copy the HSN code on activating GST for your existing data. 2. How to enter HSN code in multiple companies each having the same stock items? o Enter the HSN code in the GST Details screen at the company level. o Go to Gateway of Tally > Display > Statutory Reports > GST > GST Rate Setup , and enter the HSN code in the GST Rate Setup screen. 1. How to record expenses incurred in the furtherance of business like rent, telephone expenses, stationery and so on, and claim them under GST? Expenses incurred for the furtherance of business, such as rent (commercial), telephone bill, stationery and so on, can be claimed under GST by recording them as purchases and not as expenses. To record such purchases, create a party ledger (party from whom such goods are procured) and ensure that GSTIN of the party is updated in the ledger. When the supplier uploads his GSTR-1, the details will appear in your GSTR-2A. You can claim input credit by confirming the same in your GSTR-2. 2. How do I account for consignment sales? Consignment sales is similar to other sales under GST. You can record the sales invoice with GST ledgers (if it is taxable), and record a tax payment voucher to pay tax. 3. How to make stock transfer entry between two godowns of same organisation inside the state and outside the state? Under the GST regime, stock transfer to a godown or to an entity with a different GSTIN registration is considered taxable supply. Hence, if stock is transferred to a godown of the same organisation, it is recorded as a transfer if the godown is operating under the same GSTIN. In case the godown has a different GSTIN, it is recorded as an taxable outward supply. You can record transfers using delivery note or material out voucher types, and taxable outward supplies using sales vouchers in Tally.ERP 9. In case of supply to a godown outside the state, it is recorded as a taxable outward supply, since the same GSTIN cannot be used for business operations in two different states. 4. How to account for works contract sales and purchases? Works contract is treated as a service under GST. The works contract purchases and sales have to be recorded as taxable purchases and sales . Based on the State in which the party is located, you can select the taxable Nature of transactions provided for sales and purchases, and the GST ledgers in the invoice. 5. How to maintain transactions of job work under GST? You can manage your job work entries using the existing features of job work in Tally.ERP 9. When the GST rules related to job work are finalised, necessary changes will be incorporated, and made available in Tally.ERP 9. 6. How to record inclusive-of-tax transactions? In Tally.ERP 9 Release 5.0 and later versions, recording inclusive-of-tax transaction is simplified. Earlier you had to create a voucher class with inclusive-of-tax percentages to record inclusive-of-tax transactions. Now, this can be done by enabling the option Allow entry of rate inclusive of tax for stock item? under F12: Configure in sales or purchase invoice. 2. 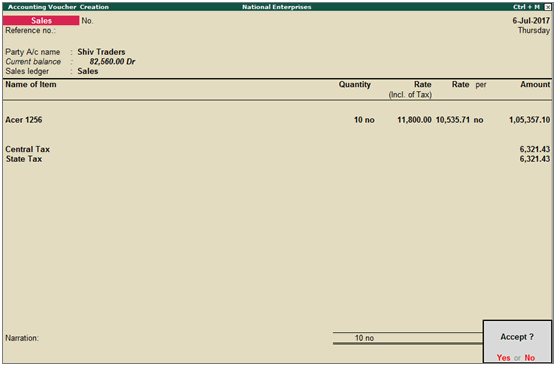 Click F12: Configure and enable the option Allow entry of rate inclusive of tax for stock item? The column Rate (Incl. of Tax) appears in the invoice. Rate (incl. of Tax): Enter the rate of the item including tax in this column. The actual rate will appear in the Rate column . The tax amount will appear automatically on selecting the tax ledgers. 1. How do I migrate Release 4.93 data to Release 6.5? Open your company in Release 6.5 and follow the on-screen instructions. For more information, refer to Upgrading to Tally.ERP 9 Release 6 . 2. How to use my existing license in both Release 4.93 and Release 6.5? After installing Tally.ERP 9 Release 6.5, select Configure your existing license in the Startup screen and enter your existing license details. For more information, refer to Configuring Tally.ERP 9 License . 3. How do I renew my TSS and upgrade to GST Release? Refer to Renewing TSS for Tally.ERP 9 and Upgrading to Tally.ERP 9 Release 6 for detailed information. 4. I have about 20 companies in Tally.ERP 9. How do I migrate all companies at one shot? After upgrading to Tally.ERP 9 Release 6, you just have to open all the companies one by one, after which data of all the companies data will be automatically migrated. 5. While opening data in an older release, it displays error "Data of incorrect version 12, can only run version 11". Data migrated to a later version of Tally.ERP 9 is not reverse compatible. This means, if you have migrated your data to the latest release, you cannot open the same data using an earlier release of Tally.ERP 9. Therefore, it is recommended that before migrating your data, take a backup or copy of your data and open the backed up data in the earlier release, if needed. 6. How to ascertain GST liability and GST input credit? The actual tax liability and input credit for your business will be available in GSTR-3 on the GSTN portal. In Tally.ERP 9, the tax liability based on the transactions recorded can be ascertained from GSTR-1 . In the summary view, the Total Tax Amount in the Total Outward Supplies section is the tax liability of your business for the period. Similarly, the Total Tax Amount in the Total Inward Supplies section of GSTR-2 is the input credit available to your business for the period. 1. Can I create GST e-Cash, e-Credit, and e-Liability masters in Tally.ERP 9? You can create ledgers named as e-Cash, e-Credit, and e-Liability in Tally ERP 9. You can maintain these ledgers separately for GST. 2. How do we carry forward excess of Input Credit to next month in Tally.ERP 9? This happens automatically in Tally. ERP 9. There is no provision to capture input credit in GSTR-1 and GSTR-2. You can check the available input tax credit in GSTR-3 by logging in to GSTIN portal. In Tally.ERP 9, check the closing balance of ledgers created under Duties & Taxes . If there is input tax to be availed the tax ledgers will show a debit balance. 3. How to create Capital Goods ledger for GST in Tally.ERP 9? ● Create the capital goods ledger under Fixed Assets . ● Select the required nature of transaction. ● Select the Nature of goods as Capital Goods . 4. What is the use of selecting Unknown as dealer registration type? If you are not sure about the registration type of your party while creating or updating the party master, you can select Unknown as the registration type in the party ledger. You can update the details later by altering the party ledger. If you want to update the details of multiple parties, you can conveniently do so from the Update Party GSTIN/UIN report. If such parties are part of taxable transactions, ensure that you update the details before filing the final returns. 5. Can I view the central tax (CGST) and state tax (SGST) bifurcation of tax amount in Profit and Loss A/c? No, the values of duties and taxes are not displayed in Profit and Loss A/c . The consolidated value of all duties and taxes is displayed in Balance Sheet under Current Liabilities . To view ledger-wise value of each tax type, drill down by selecting Duties & Taxes in Balance Sheet . 6. How to manage GST accounts when I have multiple branches in different states? You have to create a separate company for each registration obtained under GST for the branch offices, and maintain your data.